SmartMovie is a video player for your mobile device, with counterpart PC converter utility. With the converter, you may prepare any video clip for playback on your mobile device. Convert any video file on your PC into a phone-friendly video file. Upload video into device/memory card. Play the video in SmartMovie Player installed on your mobile device. Standard AVI format, allowing you to preview converted files on your PC. Player uses the phone screen in portrait or landscape mode, utilizing full screen size of the device. Rescaling of video to utilize full-screen area. PC converter allows you to split video file into multiple segments, so that it fits onto your memory card, if not entire, then cut to more parts - you may watch your favorite video in parts, e.g. while traveling to work/school. Support for subtitles - allowing you to watch movies in different languages. 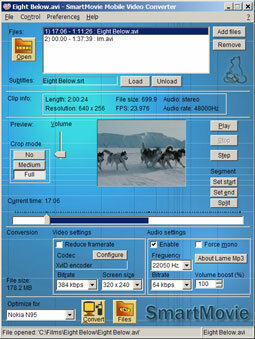 Friendly PC converter - preview videos on PC, select parts you want to convert, alter quality. Supports DirectShow codecs, so you may use video codecs downloadable from the internet. Bicubic rescale algorithm shrinks video to small screen size in best possible quality. Adjustable quality parameters for video and audio streams, allowing tuning target video to your needs. Customizable video Player (brightness, language, volume, and more).